William Forsythe tells Sarah Crompton in her program interview that his goal is ‘to make people see ballet better’ but it is immediately apparent in A Quiet Evening of Dance that in order to make us see ballet better he is also making us hear ballet better. The program is divided into two parts, the first of which has four sections and the second just one. The title of each section in the first part is related etymologically to the Greek logos, or word: Prologue, Catalogue, Epilogue and Dialogue, though not a word is spoken; they are performed in silence, to birdsong or, as in Epilogue, to a solo piano score by Morton Feldman. Costume designer Dorothee Merg adds to the sense of silence by muffling the dancers’ footware in lightweight brightly-coloured warmers or thick socks. The effect of silence concentrates our visual appreciation of the movement as if we are watching mime, an effect heightened by Merg’s covering the dancers’ arms in long, coloured gloves. If the costumes aid the silence, so does the lighting of Tanja Rühl. The denuded space of the Sadler’s Wells stage is like a light box that casts no shadows and maintains an even intensity that give individual shapes and colours a consummate clarity. In a visual environment that celebrates and enhances movement, Forsythe engages our attention in his plastic deconstruction of choreography into a catalogue of its structural components that he then rearticulates into diverse possibilities. For Forsythe, ‘choreography’s manifold incarnations are a perfect ecology of idea-logics; they do not insist on a single path to form-of-thought and persist in the hope of being without enduring’. In this way, action becomes visible as spatial duration, from its emergence to its disappearance or mutation into another movement that generates a further action — a modulation of bodily thoughts, and felt motion that communicates through and across bodies. This ‘physical thinking’ is what links a compelling evening, from silence to sound, and from choreographic logos to rich expression. Forsythe’s dancers are classically trained but have a muscular elasticity that allows them to explore his range of physical ideas to a degree that stretches beyond accepted classical form. In the opening Prologue Parvaneh Scharafali and Ander Zabala engage in a play of gesture that moves effortlessly in space but with Jill Johnson and Christopher Roman in Catalogue Forsythe enlarges the play of gesture to a successive articulation of the entire body. As they stand side by side Johnson and Roman engage in form of extended pas de deux without the partnering: a long adagio in which they constantly exchange and challenge physical ideas, a couple of short variations, and a coda. It lasts long enough for us to grasp the rules of the game and perceive in its full catalogue of logos moments of flamboyance, nonchalance and wit. Epilogue is a cumulative development in which Scharafali, Zabala, Johnson and Roman are joined by Rauf “RubberLegz” Yasit in a vibrant use of body shapes and accented colours to layer responses to Morton Feldman’s piano music. The introduction of Yasit, as his moniker suggests, mixes up the vocabulary into a choreographic puzzle that would test any notator. This is the kind of unexpected conundrum in which Forsythe revels. Dialogue introduces two more dancers, Brigel Gjoka and Riley Watts, whose exploration of space is a corporal dialogue of beginnings without ends, a fluid stream of ideas that coil classical ballet around the most contemporary dance and yet astonish in their unruffled virtuosity. They finish their dialogue neatly in fifth position with arms casually held behind their backs. 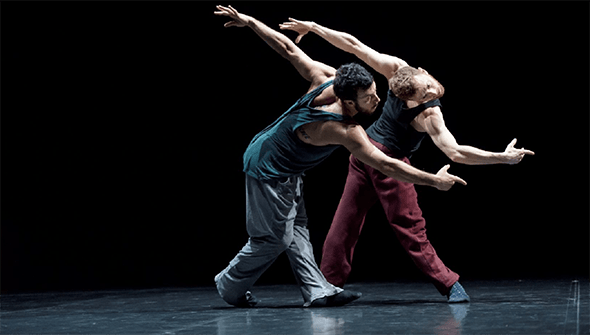 After the intermission Forsythe’s most recent work, Seventeen / Twenty One, beams with confidence, colour and music that are infectious from the outset; the choreographer is in scintillating and effulgent form. With the music of Jean-Philippe Rameau he has taken the ballet idiom closer to its courtly origins, but this is Forsythe’s baroque not that of Versailles; when Johnson enters for a duet with Roman she’s wearing a baseball cap. All the dancers generate a joy in the complexity of their tasks that matches the exuberance of Rameau’s orchestral miniatures; the score comes alive through their musicality. And if you think hip hop can’t be courtly, Forsythe gets “RubberLegz” Yasit to tie himself with exquisite musical timing into elegant knots from which he emerges serenely as if summoned suddenly by the King. In an evening of intellectual sensuality it’s a scene that brilliantly coalesces Forsythe’s exploration of choreographic form and ideas.